The Oxford is downtown Raleigh’s first English gastropub offering foods with a twist. The Oxford’s Executive Chef Christopher Hill explained that the restaurant’s menu is “all over the board.” English cuisine is a melting pot with influences from India, France, Germany and many other countries. 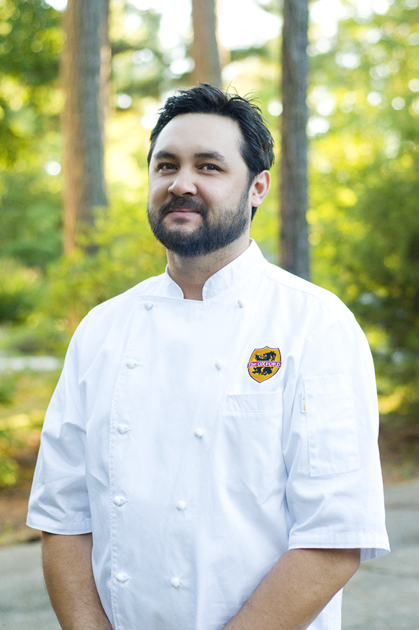 Chef Chris recently changed The Oxford’s menu to have seasonal fall offerings. One of his favorite new entrees is the braised beef short rib, a play on traditional beef wellington. This tender beef is served with foie gras spinach, gorgonzola butter, mushroom duxelle, puff pastry jewelry box and three pepper coulis. Fall has definitely arrived! Not only does Chef Chris change up the menu to reflect the seasons, he is dedicated to buying local North Carolina ingredients. FreshPoint Produce is The Oxford’s supplier of produce grown on farms in Greater Raleigh. When Chef Chris is feeling adventurous and inspired by a local ingredient, he’ll feature a special menu item at The Oxford. I had the opportunity to attend a six-course wine pairing dinner at The Oxford. This intimate dinner gave Chef Chris a chance to showcase his culinary creativity for a few of his most loyal patrons. The night started off with a refreshing and sweet peach mimosa while Chef Chris and his team were busy prepping in the kitchen. Chef Chris compared the appearance of the first course to an Oreo, a sweet treat his two daughters love. 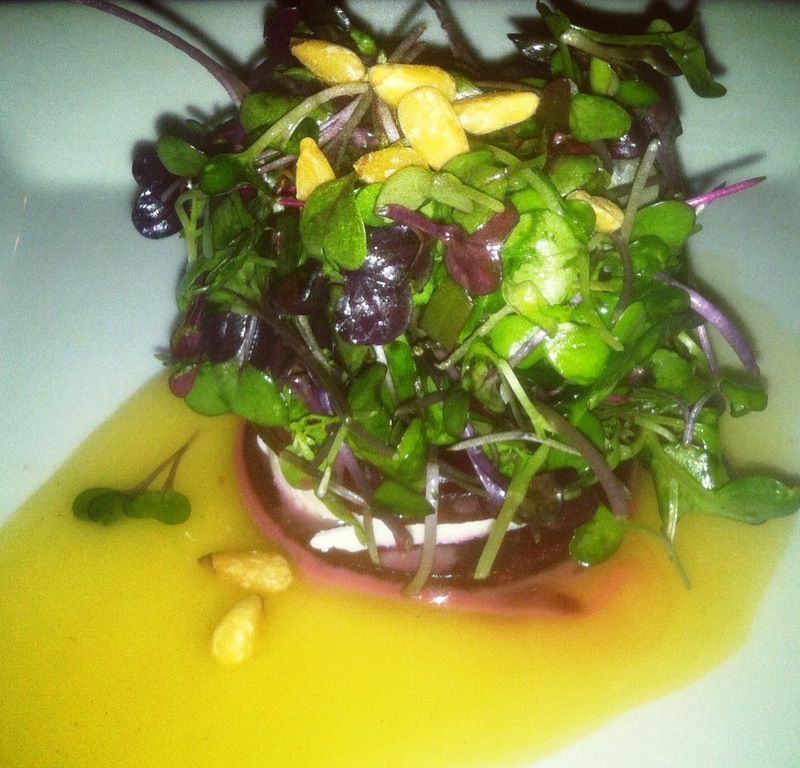 Creamy domestic goat cheese was layered between two brilliantly colored roasted beets, and was paired with 2012 Vincent Girardin “Les Vieilles Vignet.” The “beet Oreo” was topped with baby greens, toasted pine nuts and local honey vinaigrette. Let’s just say I joined the clean plate club after devouring this naturally sweet, fresh and beautiful dish. 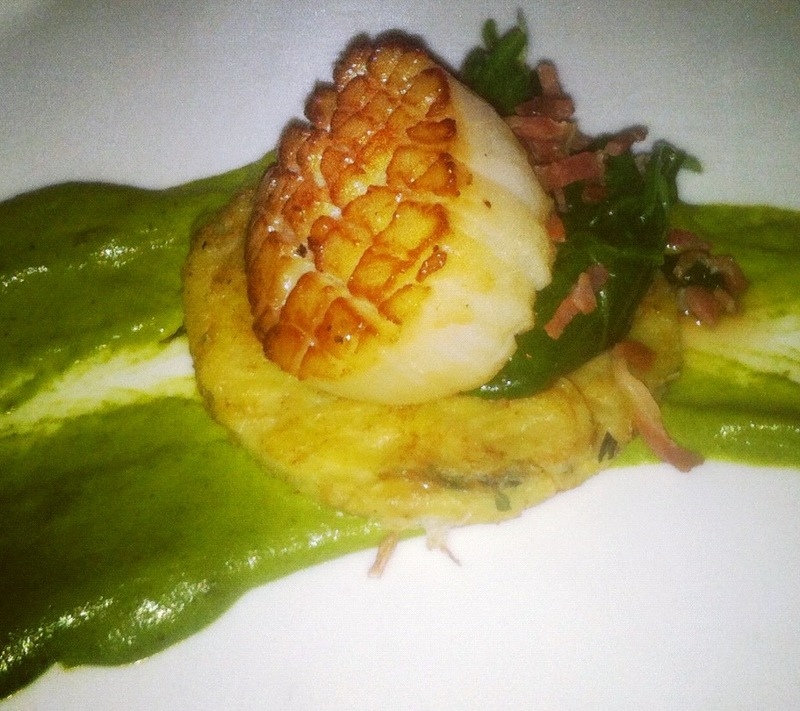 The second course was a seared “diver scallop” served with shallot-basil latke, prosciutto spinach and an asparagus crema. The scallops were tender and hand-selected for excellent quality. The asparagus crema was divine and the whole dish just melted in my mouth. I especially enjoyed the pairing of the crisp 2010 Beckman Vineyards Sauvignon Blanc. 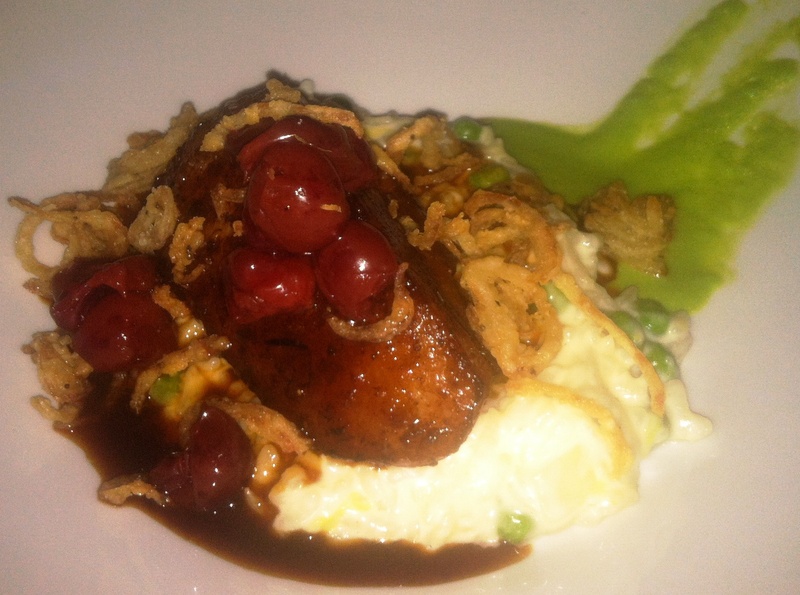 My favorite dish of the night was the third course; Dr. Pepper braised pork belly served with white stilton-pea risotto, crispy shallots and cherries. Talk about a powerful and brilliant flavor explosion! The pork belly was crispy on the outside and tender enough to cut with my fork. I especially loved the textures in this dish, from the crunch of the shallots to the creamy risotto. The dish was paired with a Berlucchi Cuvee Brut Rose N/V, which had a fruity flavor that went nicely with the cherries. After such flavorful dishes, Chef Chris cleansed our palates with a pear sorbet. 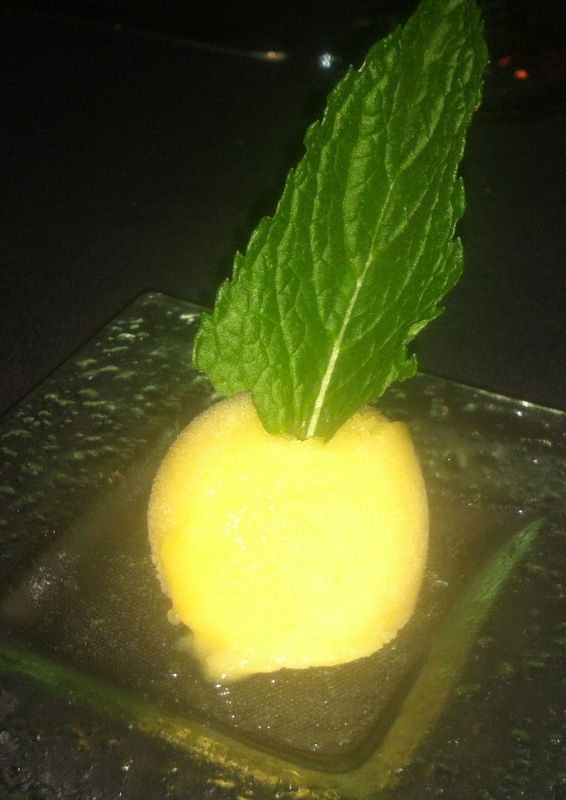 The sorbet was topped with a fresh mint leaf for a cool and refreshing fourth course. The fifth course was seared Maple Leaf Farm’s duck breast with apple brandy duck sausage, black pepper spaetzle and rosemary crème fraische. The dish was paired with a bold 2010 Beckman Vineyards “Cuvee Le Beck.” The duck was juicy and I especially loved the sweet and herbal flavors Chef Chris incorporated into the dish. The last course was one of the best desserts I’ve ever eaten! Trust me, I&apos;ve eaten a lot of dessert during my lifetime. 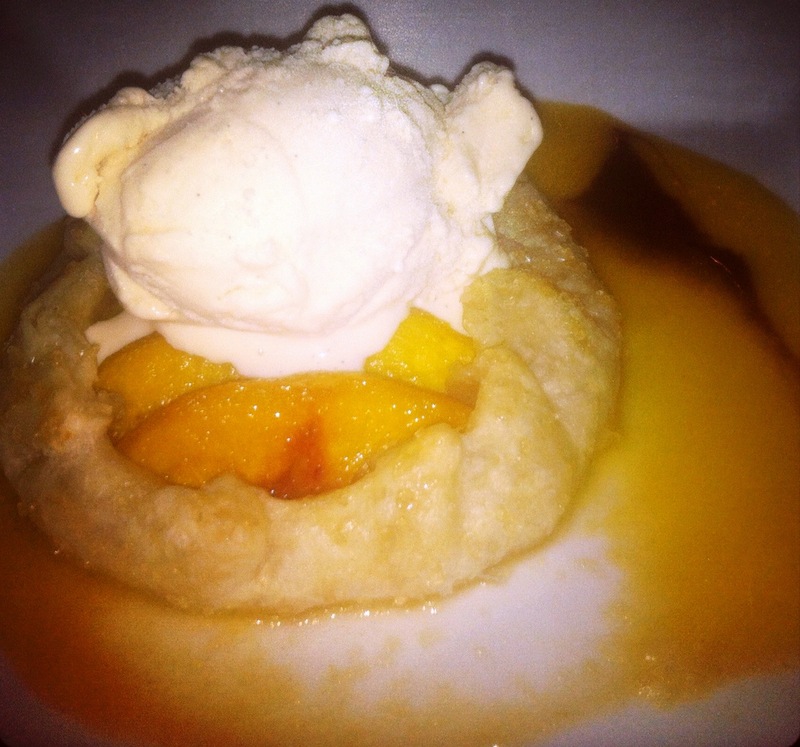 Chef Chris created a peach galette with a rich, flaky crust and extremely fresh peaches. The pastry was topped with the most delectable frozen marshmallow cream and paired with Lindeman’s “Peche,” a peach flavored beer. I appreciated how Chef Chris was able to bring the dinner to full circle by tickling our taste buds at the beginning of the night with a peach mimosa and ending the remarkable dinner with a peach galette. Chris Christopher Hill is truly an outstanding culinary professional. He’s not afraid to take risks in the kitchen and believes in perseverance. What sets Chef Chris apart is his passion for creating unique foods and the experience he gained from working in the culinary profession at such an early age. Chef Chris grew up in Marquette, Michigan and at age 14 began washing dishes at a local university’s cafeteria. He soon caught the “cooking bug” and began working his way up the kitchen ranks at restaurants in Wilmington, Raleigh, Oregon, Asheville and Cary. When he’s not cooking, Chris has a passion for skiing and snowboarding. He decided to move to Oregon where he worked in the kitchen at Mount Hood Meadows Ski Resort. Instead of getting some serious air on the slopes, he found himself working numerous hours in the kitchen. He made his way back to North Carolina and we are thankful he began working at The Oxford about eight months ago. 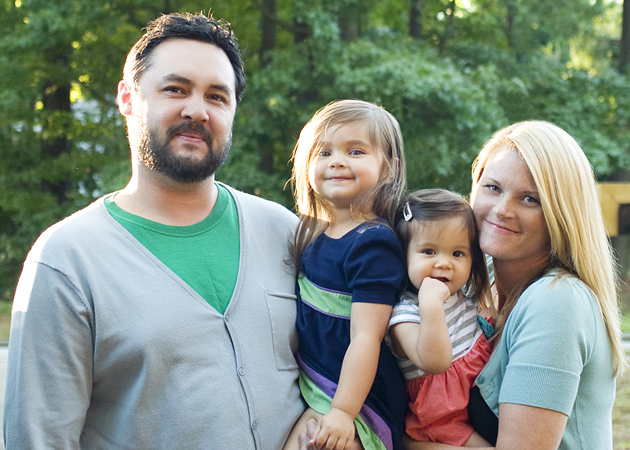 When Chris isn’t working at The Oxford, he loves spending time with his wife, Amy and two beautiful daughters. His family understands the time demands of a chef but Chris still manages to make time to goof off at Monkey Joes with his daughters, 3-year-old Lucy and 11-month-old Fiona. His family also loves the outdoors and Cary has a lot of parks for their enjoyment. 1. My favorite kitchen gadget: Vitamix Blender. 2. When I go out to eat with friends I go to: We don’t eat out often. Pizza is the family favorite and is kid-friendly so we usually go to Lilly’s Pizza at Five Points. We also love the fried chicken at Beasley’s or sushi at Sono for a date night. 3. On my iPod right now: “Nantes” by Beirut. 4. My must-have North Carolina ingredient: Bison from Asheville, it’s a learner option when you’re making a meat and potatoes dish. 5. My worst kitchen disaster: When I was working at the MacGregor Downs Country Club we did a lot of outdoor events. I was cooking burgers outside on an 8-foot gas grill during a golf tournament. The drip pan caught on fire in front of about 300 people. The golfers tried to put the fire out but just made it worse by throwing their vodka tonics on the flames! 6. I dream about cooking for: Thomas Keller. He’s the man! I’ve always looked up to him and I almost feel like I know him. 7. My favorite menu item: The cornmeal crusted rainbow trout served with bacon-caramelized onion raviolis, asparagus, basil remoulade and a lemon gastrique. 8. The hardest thing to cook: Molecular gastronomy dishes. 9. Favorite attraction in Greater Raleigh: I’ve always lived in the suburbs. I’m becoming quite fond of downtown Raleigh, I always have a blast downtown and there are so many cool events like SPARKcon. 10. In another life I would be a: Wood worker because I have to use my hands. I like the gratification of starting with something raw and making it into something extraordinary.